ANGLO-SAXON. Alfred the Great (imitative). 871-899. AR penny. 1.52 gm. 20 mm. "Guthrum" type, Canterbury style. Southern Danelaw. 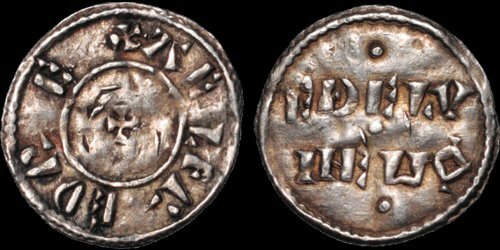 Small central cross; +AELFR EDR E around / EDELV INE MO (M upside down), Ethelvine moneyer in two lines, a pellet above, between, and below. S. 1066 (£1600). N. 635. Cf. Blackburn VII: 343. Very Fine; peck marks. Rare. Blackburn, M. Viking Coinage and Currency in the British Isles. BNS 7. 2011. Also cf. BNJ 59 (1989) p. 33: 43.